There are best practices and top market leaders across every industry. Companies who have “been there” and “done that” can teach you invaluable lessons that can be applied to SaaS startups. We’re big believers in this – hence our Iconic Products series. But, what if we stepped out of the box for a moment, and considered lessons that we could learn from industries outside of SaaS and tech? Some of these companies are disruptors, while others are legacy companies that have learned to adapt and create brilliant paths for themselves in an ever-changing business landscape. What started as a skateboarding and clothing brand in New York in 1994 has catapulted itself into the forefront of pop culture and brand devotion. People fly in from all over the world in order to stand in line for hours just to go into one of Supreme’s 11 brick-and-mortar stores and try their luck of finding that perfect overpriced t-shirt or brick or whatever other weird item they’re selling that week. Oh, and this happens outside of drop days, too. Just walk around London’s (or New York’s, for that matter) SoHo neighborhood on a Saturday morning and count how many blocks are covered with people lined up waiting for Supreme to open. Many people cite the “hype” around the brand, but surely it’s about more than that. There are plenty of people who get excited about the latest Yeezy shoes or OVO hoodie (confession time: I’m kind of one of those people) – but neither of those brands even come close to the level of hype around Supreme. But let’s get a bit deeper – let’s consider the psychology around the customer. Jonathan Gabay, author of Brand Psychology: Consumer Perceptions, Corporate Reputations, goes even further in the article, saying, "[Importantly], Supreme was started in the right bit of New York by skaters. That makes it authentic, or seen to be authentic. “The fact that they've brought in other designers over the years is irrelevant; it all goes back to the fact that the original people who wore this stuff were authentic—they weren't wearing it because it was trendy." "A brand is an extension of oneself—psychologically, in terms of how you want the world to see you, or what you want the world to believe you are," said Gabay. "But deeper than that: what you believe you are, through that brand." Obviously, these three concepts are easier to say than to actually apply to your startups – but think of them as guiding points for a moment. Do you have a new product that you’re trying to launch? Perhaps start a waitlist to get people excited about it, and offer certain perks, such as early access or special discounts. Create a sense of scarcity and exclusivity around your product. Many companies can only dream of having the success of a brand like Supreme, but as you can see, there are lessons to be learned from how they “made it” that can be applied to just about any industry – including SaaS and tech. Think about the customer and how they interact with the brand. Are you telling the story you want to be telling with your brand? Is your company authentic in how it describes its offering? Are there ways in which you could build some excitement around your brand? Of course, both of those things still exist, but let’s be real: news media, especially print media, was perhaps the most deeply disrupted industry by the mass adoption of the internet. This led the news media industry into a crisis mode. What’s next? How do you generate revenue when people aren’t buying your paper? Well, in the case of The New York Times and many other outlets that followed suit, it was an adapt-or-perish situation. The Times was nearly 150 years old when the internet started transforming the way people got their information. This meant that they needed to innovate quickly, despite having such a long legacy and despite being so deeply rooted in its own culture. But unlike many other newspapers who were stubborn about embracing a transition to digital, the Times decided to go all in. In 2011, they introduced their paywall, and in 2013, hired more than 100 tech employees in one year. And it didn’t just stop there. On top of their new tech employees strengthening the user experience of their website and app, they also started a products department that was tasked with releasing new apps and new revenue sources. This resulted in three new successful apps around their opinion section, streamlined news for millennials and cooking – PLUS a huge partnership with Google by creating a new VR app for the Google Cardboard headsets. If one of the most historical newsrooms in the world can modernize and adapt to the changing times – there’s hope for the rest of us. And no, it doesn’t mean you need to hire 100 new employees or aggressively launch a VR app. It’s about understanding the landscape, and identifying where your customers are – and how you can effectively reach them. Embracing the future of how things work and how customers behave is crucial in setting your company apart from the rest. Startups are much more poised to disrupt and change industries than legacy companies, but that change won’t come automatically or overnight. It’s about finding the strategy that works best for your company and being where your customers are (and offering the right product or service). Not in the sense of people crying over their couch, but rather the fact that it’s an expensive purchase that is supposed to last you for years. Plus, the logistics of getting a large piece of furniture delivered to your house or apartment is a commitment in itself – you need to pay a ridiculous fee, wait around all day for the delivery people to show up and then get everything set up. It can feel a bit exhausting when it’s all said and done. But this is exactly why startups such as Casper and Burrow are changing the furniture game. Similarly, Burrow designs and manufactures uncompromising furniture and other goods for modern life at home. The company launched in 2017 with a modular sofa and has since expanded to multiple configurations of living room seating. So, how do they pull off a seamless experience with something that is supposed to be a high-investment, emotional purchase for their customers? Casper recognized the pain points mentioned above and decided to change things up. As Casper’s co-founders have explained in multiple interviews, it was originally about disrupting the mattress industry, because it was so obviously broken. And more importantly, they wanted the experience to be top-notch. In Casper’s earlier days, there was a couple who made a YouTube video about their mattress. They explained that the bed wasn’t right for them, but the experience was incredible. If you make your customers happy, in the case of Casper, those customers give you more word-of-mouth business and might even end up buying other products, such as pillows or a nightstand. Casper has explained that their return rate is rather low, so they try to donate returned mattresses to a local charity which, in the end, is more cost-effective than taking them back across the country to refurbish and try to resell the product. In the case of Burrow, they offer modular furniture – essentially, a customer can purchase an armchair and later decide to turn it into a larger sofa by buying a loveseat and connecting them. And vice versa – you can turn a larger sofa into a loveseat or four separate chairs. On top of that, Burrow offers hidden USB charging ports in the furniture, so you never have to get up to charge your phone – handy. Like Casper, shipping is free and delivery is usually within a week. See a pattern? These startups have managed to identify all of the pain points of buying large furniture and completely turned the business model on its head. But what about those who are still apprehensive about just buying furniture online? It’s time to go physical. For those among us who want to feel, see and touch a mattress or couch that we want to buy – ordering one online might evoke anxiety or fear. Are you really going to be happy with something that you buy before trying? Fortunately, this is the exact concept that these companies are exploring. 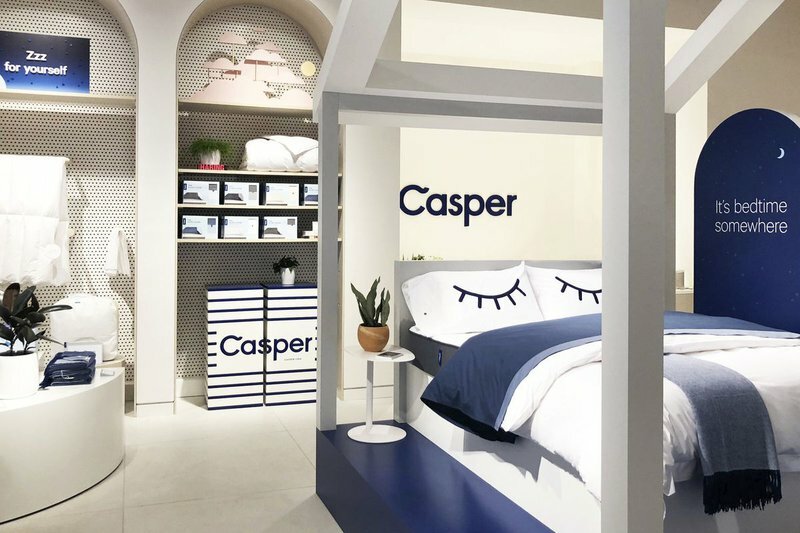 Casper recently partnered with retail giant Target and on top of that, also plans to open 200 Casper stores across the United States. In the case of Burrow, the young company originally entered physical spaces in the form of partnerships with co-working spaces and breweries – you can even apply on their website to host a showroom in your space. Now, they have a showroom in the SoHo neighborhood of New York. This gives customers the chance to experience Burrow’s products IRL. Disrupting an industry is all about identifying and eliminating pain points. How can you make your customer experience even better? Do customers walk away from your company feeling positively or negatively? But it’s not just about learning from companies in your industry. SaaS companies can learn a lot from seeing how things are done across a variety of industries. Or even in eyeglasses – with companies such as Warby Parker or Zenni Optical.